By the time the game ended, Matt Donato had Walpole feeling right at home. 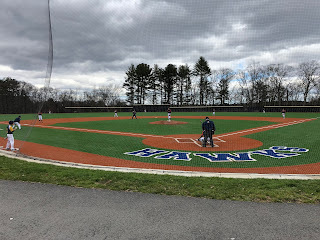 With the Rebels and Xaverian tied at two in the bottom half of the eighth, Donato drilled a walk-off single to left center field to send Walpole home with a 3-2 win over the Hawks on Tuesday afternoon at Xaverian Brothers High School. Despite it being Walpole’s home game, the game was played at Xaverian due to field conditions at Walpole High. The game entered the eighth inning tied at two. In the top half of the eight against Donato, who relieved Rebels’ ace Cam Schlittler, the Hawks threatened. Charlie Bean singled and two batters later Craig Jones reached on an infield hit to put two on with two out. Donato, however, induced a groundball to third off the bat of Sean Birch to set the stage for his own heroics in the bottom half of the inning. Rebels’ catcher Tyler Page began the inning with a single to center and Bryan Kraus followed with a walk. Xaverian number-one starter Owen Langan got a 6-6-3 double play grounder for the first two outs of the inning, but the winning run moved just 90 feet away. Staring a potential ninth inning in the face, Donato came through rocketing an 0-1 fastball for the game winning RBI base hit. Schlittler (7 IP, 2 ER, 8 H, 2 BB, and 3 SO) and Hawks’ starter Sean Birch (4 IP, 4 H, 0 BB, 5 SO) were spotless through the first four innings combining to allow just five singles. In the home half of the fifth, the Rebels broke through. After getting the first two outs of the inning Hawks’ reliever John Bruzzese gave out a pair of free passes to put two men on. Rebels’ leadoff hitter Jack Magane took full advantage of the opportunity singling to center field to bring home the first run of the game. Two batters later the Rebels added to their lead as Page was hit in the head with a curveball to force in the second run of the inning. Xaverian used some two out magic of its own to even the score in the top half of the sixth. Jack Whorf grounded a single to center and advanced to second on a wild pitch. Bean got the Hawks on the board with an RBI single back through the box to trim the deficit to 2-1 before Kyle Sylvester even the game up with a run scoring double to right. The Hawks had a chance to take the lead one inning later. Jones reached on a fielder’s choice and Chris Ducko turned on the after burners to beat out a groundball to shortstop. Xaverian two-hitter Jake Cassidy then seemed to have put the Hawks in front with a base hit up the middle, but the Rebels’ shortstop in Magane made a full out diving stop and flipped to second baseman Aiden Murray to retire the side.